Tor/Forge Author Voices Vol #1 will release at RWA via a QR code at the Tor table and will take fans to a landing page allowing them to download roughly 400 pages in a pdf or epub file. The volume will contain excerpts from upcoming books by section: Urban Fantasy/Horror/Paranormal; Science Fiction/Fantasy; and Thriller/Mystery/Women’s Fiction and Historicals; author articles previously published in the newsletter throughout the previous year; and an original short story by RITA nominated Deborah Coonts, (Lucky Stiff, Forge 2011). An essay titled “5 Tor/Forge Editors talk about Writing, Publishing and Falling in Love” will round out Vol #1. A QR Code is a black and white code that you take a picture of with your camera and the code launches a website or something else to lead you to the download link. Wattpad is a writing and community platform. They have a robust romance community (although I haven’t checked it out). Wattpad reached out to let the DA community know about a new summer project by author, Heather McGhee. The novel “Old Flames” is halfway complete and McGhee outlines where she wants to go and the readers can weigh in on how the characters would feel for potential plot turns and twists. Readers can leave their comments and ideas and read other readers’ input. You can find out more here. My understanding is that this sort of interactive fiction is very popular with teens and YA readers. Blogs and reviews have a notable influence on buying decisions with 63% of social media users reading reviews before making a purchase decision. On average people read six reviews before making a decision. However only 24% of online users post blogs or reviews, so reaching that 24% of ‘influencers’ is key for marketers. Books formed only 5% of the products or services researched on social networking sites. When it comes to providing online ratings only 3% of products or services rated were books (this is customers making comments on the products they have purchased). Harlequin is to make a number of big announcements at RWA including reorganization of its lines and a new Harlequin digital royalty rate. Courtney Milan cited the low 8% digital royalty rate for her single title books as one of the reasons she decided to self publish. Five years ago, I wrote about how the low digital royalty rate was effectively allowing Harlequin to experiment with digital publishing at lower cost. The problem with this model is not just that it is inequitable but that it requires the author to be a capital investor in a venture from which she will not see any benefit. Essentially, Harlequin is asking authors to take a lower rate now so that it can recoup its technology investment. While it says that “Once eBooks becomes a profitable business Harlequin will re-evaluate the eBook royalty rates we are offering vis-a-vis that of competitive publishers” what motivation with Harlequin have to revise and pay a higher rate? It’s not in the contract. The contract has a flat rate and there is no provision for re-negotiation based upon the profitability of the ebook venture. Why not pay an independent editor to edit your book, invest $2000 in marketing for yourself and sell the book yourself or through the Sony Connect Store for $200. Or even to Samhain or Ellora’s Cave. Will Harlequin still be a player in a few years with its inequitable contracts or is its investment in ebook technology built on the sales of current authors be its saving grace? And if so, what will Harlequin do to repay them? Because the question isn’t whether I can make $425,000 in three years in self-publishing; the question is what happens regardless of when I hit that number. What happens whenever I hit that point is that I’ll have ‘beaten’ the contract, and then I’ll go on beating it for the rest of my life. If I don’t earn out the legacy contract, the only money I’ll ever see from it is $142,000 per year for three years. Even if I do earn out, I’ll only see 14.9% of each digital sale thereafter. But once I beat the contract in digital, even if it takes longer than three years, I go on earning 70% of each digital sale forever thereafter. Harlequin has responded that it will pay any authors ACTIVELY writing for them a 15% digital royalty off an undefined net for category books and a 25% digital royalty off an undefined net for single title books. 25% off the net is kind of an industry standard at the present. Category authors have privately and publicly shared that this is not acceptable but my guess is that Harlequin believes that the line is more important than the author which is why the category authors are paid less. How many authors leave the lines for self publishing or digital publishing remains to be seen. You can see the actual emails sent to authors here. Speaking of Courtney Milan and her self publishing endeavors, Unlocked has caught the attention of Amazon. In a mailer that went out on Thursday, Amazon suggested to its romance readers that Unlocked was a “top rated” romance book. (Click on the screencap taken by Sarah Wendell) Prior to this mailer, Unlocked was at a very respectable 68+ on the Kindle bestseller list. Within hours, Unlocked moved to the #2 overall position, sitting right behind Janet Evanovich’s Smokin’ Seventeen which sold 100,000 digital copies on its first day of sale. It’s #4 today. With its Sunshine Deals and this type of direct marketing, Amazon has shown it can move the needle for books that it profiles. This will be the new end cap in the digital age. Of course, the question that is raised in my mind is why Amazon isn’t doing more to promote its upcoming authors for Montlake or Thomas & Mercer? I have a lot of concerns about self publishing, Amazon’s venture into publishing, and the like because even established authors– whom I believe should know better–are putting out really crappy product. This is one reason I am thrilled with Milan’s success. She’s put a ton of effort into putting out a quality product and she appears to really respect her readers. Other authors, authors who have been in publishing for a long time, are putting up stuff like this. The castle buzzed with activity. Floors were mopped, privies limed, larders stocked, bedding laundered. Carpets were beaten, faces washed and new tapers set in place of the old, even if the old were not yet burnt out. 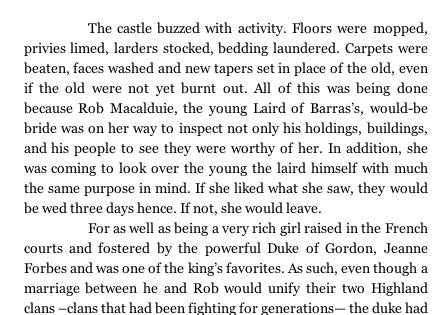 All of this was being done because Rob Macalduie, the young Laird of Barras’s, would-be bride was on her way to inspect not only his holdings, buildings, and his people to see they were worthy of her. In addition, she was coming to look over the young the laird himself with much the same purpose in mind. If she liked what she saw, they would be wed three days hence. If not, she would leave. For as well as being a very rich girl raised in the French courts and fostered by the powerful Duke of Gordon, Jeanne Forbes and was one of the king’s favorites. As such, even though a marriage between he and Rob would unify their two Highland clans –clans that had been fighting for generations– the duke had given her the unprecedented prerogative to deny Rob’s suit if she didn’t find favor with him. It was not a pronouncement that anyone in the clan, their wealth and manpower depleted by years of contention, liked. (Link to screenshot) I won’t link to the book or name the author but I’ve been struggling with both sadness and frustration that we are seeing this sort of thing from an established author. This author is actually someone who I really enjoy reading. I’ve recommended her books to others. I don’t know what good conclusions can be drawn from something like this. I mentioned to others that I wonder if this is some insidious campaign by traditional publishers to prove to readers that low priced books can’t produce a quality product. If you are a print published author, the April sales news is utterly depressing. Mass markets were down 41.6% as were all other sectors except digital books. But the increase in digital sales were not enough to make up for the loss of paper book sales revenue. Source Publishers Weekly. This month’s issue of RT Magazine postulates that readers have a lower tolerance for typos in ebooks than in paperback/hardcovers. I don’t necessarily think that is so. If typos or poor grammar are a person’s particular bête noire, then the format doesn’t really matter. Either venue is unacceptable. I also think that in traditional publishing, the fault is spread around (authors, copy editors, etc). A reader may give an author the benefit of the doubt. However, in ebooks, the criticism falls entirely on the author. In this respect, an author’s reputation for quality may be more damaged in ebook typos than in books issued through a NYC publishing house. @Kim I know that when books were first being digitized, I was really tolerant of typos and the like because I was just so damn grateful I could buy legitimate ecopies of the books I wanted to read. I think I am more tolerant of OCR errors but this example I gave doesn’t seem like OCR errors, but true copyediting and proofreading errors. I think one reason that it appears readers don’t care is that John Locke, Amanda Hocking and the like have had terrible typoes, grammatical missteps, etc. and still are selling tremendously. I wonder if we aren’t in a really remarkable time of self publishing and that as it becomes more popular and more “courtney milan” type products are put on the market that readers will become less willing to accept error ridden digital books. I really don’t know. @Another Kim Ouch. I’m sorry. I was led to believe that this was sent out to the authors. My concern with self-publishing is the sheer amount of never-published authors who enter into self-publishing and aren’t forced to learn the craft. The submission/rejection process makes us all better writers. Yet, these authors circumvent this process and believe they know better than those who’ve rejected them. They don’t need to improve because everyone else was wrong about their story, and they’re right. I call it the karaoke model of writing. The good small presses are a much better route to go. They give an author experience working with an editor, marketing their books, and learning the profession of writing. Personally, I prefer the small presses. I like the personal attention you get by an editor, among other things. Since I have a full-time day job, I don’t have time to deal with all the details an author needs to handle to be self-published. Regarding Amazon’s ability to move the needle on books they promote–they didn’t JUST move the needle for the books that were highlighted in that email. There was a huge jump in the overall Kindle rankings for a LOT of lower-priced romance titles, including my short story, THE REIVER, which went from hanging around in the mid 1k’s overall to a peak of 323. The highest ranking the story had ever achieved before that was around 1,000, but because of the story’s association with Paula Quinn’s book (which was highlighted in the email) and with other books in her Also Bought list, I experience a HUGE jump in sales that day. My numbers have slacked since then, but the story is still selling more copies per day than it ever has before. That outtake from “that story” makes me a little ill. I don’t understand how ANY author–respected and well-known or brand spanking new–can delude themselves into believing that anyone should pay for something that poorly written/edited. Frankly, I wouldn’t put up a blog post that contained that many errors in it, and people can read those for free. Heck, I’d die of shame if a comment I posted on someone else’s blog was that riddled with errors. The fact that ANY author can feel remotely comfortable offering something of such poor quality for SALE is an outrage and an insult to readers. I’m moving primarily to self-publishing for the time being, but when I made that decision, I also made a solemn vow that I will never rush a book to market just to make a few extra dollars. I can’t guarantee that my books will be to everyone’s tastes, so I can’t promise anyone will think my books are “good”, but when it comes to editing and formatting, I’ll do my absolute damnedest to produce as perfect a book as humanly possible. Courtney Milan is my role model on that front. On the typos in ebooks thing… I won’t read a self-published author unless they clearly state somewhere (blog, web site, etc.) that they HIRED A PROFESSIONAL EDITOR to edit their book. An author I like actually said a blog post yesterday “please forgive the apostrophes” and then went on to use !!!! at the end of every sentence because she was excited about something. Thank goodness she does not self-publish – that was all I could think. Frankly, if you self-publish, a lot of how well edited the book winds up being is on you. Because you can’t recognize a good edit from a bad one if you don’t know the rules yourself. Alas, unless the person you hired is competent and thorough, you can pay for an edit and still wind up with a book that’s riddled with errors. First, you can hire my copy-editor–I’m getting a stack of business cards from her and will be handing them out at RWA, and she is AMAZING. If your natural writing has way more errors in it, you will need to hire more than one person. If you’re dealing with more than one error per paragraph, a copy-editor cannot clean up all of them, and fixing the errors you have will inevitably introduce more errors. Editing should be done in stages, not one fell swoop. Anyone who expects otherwise is doomed to disappointment. As always, there are exceptions to this rule–true masters who can catch absolutely everything on their own. But I’ve yet to meet one. I’m inclined to agree with you, but I can see where RT may have gotten this idea. Ereading readers are the wealthiest, best educated and most voracious readers. So perhaps it’s not the format that leads to lower tolerance so much as the type of reader who is likely to read in ebook. all of these contracts (with the exception of the 1982 Mills & Boon agreement) are with a parent, corporate entity in Switzerland. In the earlier contracts, it is Harlequin Enterprises, B.V., and in later agreements, Harlequin Enterprises S.A. For our purposes, these are one and the same. Without going into a great deal of technical explanation (which is beyond my abilities in any event), Harlequin has structured the author contract so that your agreement is with, what is in effect, this holding company, but the actual publisher (or receiver of funds from the sales of copies of the work) are various imprints and divisions (subsidiaries of the company) in the US, Canada and elsewhere throughout the world. When the contracts speak of “related licensees,” it is referring to these subsidiary entities. Apparently actual license agreements were/are regularly entered into between each of these subsidiaries and first HEBV, now HESA. What does this have to do with the royalty rates? Well, in the contracts between 1985 an 1996, the applicable royalty provision for e-books is 50% of the Net Amount Received for such sales. This actually means 50% of the monies received by HEBV (or HESA) from the license agreement it has with the appropriate imprint/division publishing and selling the e-books. As a result of some communications between the Harlequin contracts department and myself on behalf of an author, I learned that the current licensing arrangement provides that HEBV (or HESA) receives royalties on e-books at the same rate as provided for in current author contracts for e-book royalties (namely rates starting at 6% of cover price). Sadly, what this means for authors, is that you are entitled to only half of that amount or a royalty equivalent to 3% of cover price. So 50% of net, because Harlequin is licensing with itself, is not 50% of the amount received from Amazon, but 50% of the amount it gives itself. 25% of net, if this definition were applied, would be 2% of the cover price, not 17.5% of the cover price. I’m not currently writing for Harlequin, and so I won’t get 25% of net, but if I knew that they could play internal games with parent/child corporations to change my take at any moment, I wouldn’t be terribly happy with this. Oh, where did my edit button go? I forgot to close a tag. Jane, help! @Courtney Milan: The definition of “active” really puzzles me, especially when applied to the digital lines or to authors who have submitted the last book under a contract but have not yet submitted or received an offer on the option book. To me, you can’t be “inactive” if you still have a manuscript on contract that has not been published. If your interpretation of “active” is correct, then I am not an active Harlequin author either, despite the fact that I have a release from them this year. I have to say I find that rather…unfair. But… wait. Amazon actually PROMOTED a self-pub writer in its worthless emails?! (Worthless because they tend to pimp the wad bestsellers that bore me.) That is news. Good for Courtney and her red Romance. @Courtney Milan: Since the edit function seems hopelessly screwy even when the button exists, I’ll add that given Ms. English’s interpretations, perhaps I should be HAPPY if I’m not active and/or the 25% of net rule doesn’t apply to me. I have to say, I thought the harlequin rate-changing letters were a hoax when I first read them. So many ways they just don’t make sense. Not the least of which is that my contracts with them clearly state we can’t change the contract without signatures of agreement on both sides. But friends with agents have sent me actual copies of the letters and now I’m thinking it’s real. And I still don’t know what they mean by any given percent of net. It’s a different wording in the letters than in my old “50% of net” contracts. So that will be my question, first. What do you mean by net? You see why I need to hire more than one editor? This is also why I send my books through an HTML validator. And why I proof every format I put out. One little mistake can screw up the whole thing. Happy to be today’s object lesson. Yes, our edit plugin is really sucky and what makes it worse is that it is a premium plugin. off to beg Brave New Code to plugin-ize their edit comment feature. As always, there are exceptions to this rule–true masters who can catch absolutely everything on their own. I doubt it very much. I used to work as a proofreader at a marketing communications firm, proofreading ads and other marketing materials (even in-store announcements) for corporations like American Express and Wal-Mart, and not only did several people have to check and sign off on an ad, we also had a rule there that if one of us had written the ad copy, someone else in the firm had to final pass proof it. You cannot proofread your own writing and expect to catch every error because your mind knows what you intended to write, and sometimes you will read that instead of what you’ve actually written. BTW, another rule we had was always, always print everything before proofing it. Your eye will miss more errors on a computer screen. @Courtney Milan: I’m fairly confident in the process I’ve been through at Cobblestone, where each book receives three editorial passes from the same editor, and is then given a final formatting proof by another editor before being “e-booked”–for lack of a better term, lol. I certainly won’t guarantee that every book I’ve ever done with them is 100% error-free, but then, neither was my Kensington book or my first Brief (we can have hopes for the second if I can get them to let me see it again in copy edits, sigh). Formatting, though…definitely something I’ll have to hire someone to vet more thoroughly. For my short story, I was a little less worried once I had a good, clean HTML version, since it has no chapter breaks, no table of contents, etc. When I produce my novella, it will be a lot more important to validate everything because it’s so much longer and there are so many more possible places to fall down. For me, this is absolutely not the case. I’ve been writing online documentation and editing on the screen for so long (15+ years) now that PRINTED copy is harder for me to find errors in than computer screen copy. I know this is not the case for most people, but it isn’t a hard-and-fast rule, IMO. @Janine: I doubt it very much. I’m happy to let someone think they are infallible and avoid the argument. I have a whole set of rules for incorporation of errors, proofing, et cetera, that I will probably write up at some point. And, also, I’m giving a workshop on this at Chicago North’s 2012 Spring Fling (so go if you can). @Jackie Barbosa: That’s interesting. As much time as I spend in front of a computer screen, I still see the errors better on paper. @Courtney Milan: Ah, gotcha. I wouldn’t want to argue with them either. I’d love to attend your workshop, if I can swing it. @Janine: I honestly think I learned the skill through sheer necessity. In my job, the option of printing something out often does not exist, so I simply had to adjust to editing on-screen. It looks like the only review of the novella takes on editing errors, formatting glitches, bad use of historical research and plotting problems. Quite a few issues for a mere 30 pages. I continue to be intrigued by authors who successfully self-publish (see Courtney Milan) and Amazon’s marketing strategies with self-published authors and their own authors (see Montlake authors). I think Amazon’s “market muscle” if you will is fascinating and frankly, intriguing. I am a new author with a smaller press and while I had/have the benefit of numerous editors (substantive, copy-editors, and proofreaders), the one thing I find my publisher lacking is a definitive vision for marketing. While my book is available in both print and digital format all over the place (B&N, Amazon, All Romance etc. ), it wasn’t tagged anywhere and I wish my publisher did more to market the book. was the review wrong or unfair? or were the reviewer’s comments valid? as someone who has been away from romance (and genre fiction in general) for a number of years AND as someone taking the plunge into e-reading via kindle for pc, there are a lot of new authors i’m not familiar with. i take full advantage therefore of the two-chapter previews. there is a lot of garbage out there, to be sure, and i don’t buy it. much as it pains me to write this, i think there has been a steady and pervasive dumbing down of our written, and therefore read, communication skills. if a person more often writes/texts just yr for your/you’re, how will they know or even care that there’s a difference? ‘well they know what i meant’ has been the response for at least a generation. i think most of the complaints about formatting glitches and the excessive ‘typos’ that come from OCR conversion are coming from readers accustomed to higher quality — if not 100%+ perfect — printing on paper. OCR conversion may turn ‘fish’ into ‘fist’ but it won’t change good syntax into bad or move the storming of the bastille to 1776. as more and more digital books are published directly from digital files rather than OCRed from print, i’d expect the number of glitches to decrease dramatically. then it will be a matter of the quality of the story. anyway that’s what i think will happen. maybe. One thing I recently learned was that most, if not all, of the big 6 use Distributors to get their eBooks to the various vendors. The standard cut for the distributor is 20% and, after looking at my contracts, that’s one of the costs that explicitly counts as an expense deducted from the net. So the distributor, if used, gets a better deal than the author. And, it means that the “net” used for author royalty calculations is 20% less than everyone is assuming. That said, readers, authors and others need to stop claiming that there is no overhead to an eBook. There is overhead. Certain sunk costs are not incurred (assuming the same cover is used) and certain editorial expenses are not incurred, but as Courtney Milan points out, the process of creating the eBook itself can (and does) introduce errors. The books needs to be proofread again for introduced errors AND for formatting errors. There’s also staff with the right skills, or the contractors who get that work outsourced to them. Those contractors would be an expense that reduces the net. So, it’s a bit more complicated and opaque. i don’t think anyone is saying there’s no overhead to re-pubbing as e-book. but there are no production (printing, binding, warehousing) costs. unless there’s going to be some kind of revised ‘author’s cut,’ the original editing costs are gone, as is original artwork if the publisher uses the same cover. forgive me but the only word i can think of to describe the 2% royalty harlequin is paying is f****** obscene. i can’t for the life of me figure out how that is justified, or why anyone in her right mind would today sign a contract with them. seriously, why?? is it for the ‘cachet’ of harlequin’s name? is that cachet worth the difference in royalties between 70% and 2%? even throwing in the cost of doing one’s own prep work — acquiring artwork, copyediting, etc — where’s the advantage? is it all in some mystical aura that accrues to ‘i’m a harlequin author’?